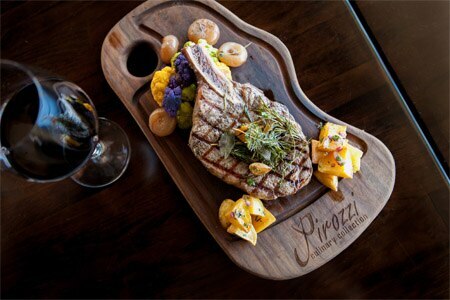 Alessandro Pirozzi’s cozy Corona Del Mar restaurant pairs Italian cuisine with a solid wine list. : Executive chef and restaurateur Alessandro Pirozzi knows a thing or two about creating a notable Italian dining experience, as demonstrated by his other properties, Alessa and Mare Culinary Lounge. Pirozzi’s eponymous Corona Del Mar venue touts exposed brick, dark woods and an intimately spaced interior that creates a warm, communal vibe, an ideal backdrop for the handmade pastas, pizzas and other Italian delights. Starters such as the flash-fried cheese-stuffed olives, wild boar sausage-stuffed quail, and arugula salad with Mediterranean octopus and calamari are prepared with enough simplicity to allow the natural interplay of the flavors to shine. Charcuterie from a deep selection, ranging from venison salami to classic Iberico ham, is a fine option for an intermezzo. Limoncello-infused taglierini with prawns is a must-try entrée, but consider as well the veal osso buco ravioli and New Zealand elk chop. Desserts like affogato and the salted caramel gelato show that the last course is not an afterthought. And while the wine list is not sprawling, it does a very good job of showcasing distinctive labels from around the globe.